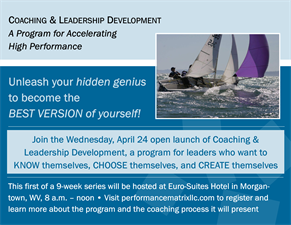 The launch is free to area leaders, entrepreneurs, and decision makers. To get better you need to experience an intervention, because we know you won't get better by yourself! We know; we've been there! If your business is doing "OK", is that good enough? Larger and adjacent regions have their eyes and—in many cases—their competative sights on your orgaization. We're offering an internationally proven and proprierity leadership development and coaching process to regional leaders, entrepreneeurs, and decison makers to see what an intervention can do for you and your organization.